Okay - if there's one thing that I think every American can agree on for once - it's that food on a stick is delicious. But there is magic lurking there on that burning piece of earth. I especially loved the agriculture pavilions, where you could go see both the animals and the technology that you find on American farms. There are petting zoos and rodeo events, cooking contests, art exhibits and much, much more. For whatever reason though, county and state fairs are MOST known for their food on a stick, and in Texas, at the heart of the stick food is the Fletcher's corn dog. That slightly sweet batter and deep fried perfection comes flying into the mind any time anyone says the word "fair" to a Texan. Yes, there's also deep fried butter (not kidding), deep fried Snickers, deep fried ice cream, Spam, you name it, but our Texas State love affair begins and ends with a Fletcher's corn dog. MMM I could use one right now! Anyway, the theme of this month's Hero Arts kit and add-ons is County Fair, so it speaks to my corn dog loving heart in an epic way. The images are adorable, and it's one of those kits that will be good for all occasions and all year, which I love. So I'll start with my favorite image from the main kit, which is the long, border silhouette of the fair. It's so detailed and beautiful, that it makes for very quick cards. I stamped the image on an old Gel Press print, and then stamped the little airplane with a banner above it. The gold glitter paper is the new no-shed paper from Concord & 9th, and I die cut the little stars out of that as well with this die. I took the same image from the kit and used it on an Artist Trading Coin for a one for one swap in my Facebook Community Group - I've been waiting to post a photo of it in our group till today! I cut the coin with the Circle Infinity Dies from Fabriano watercolor paper and just blobbed watercolor on it. 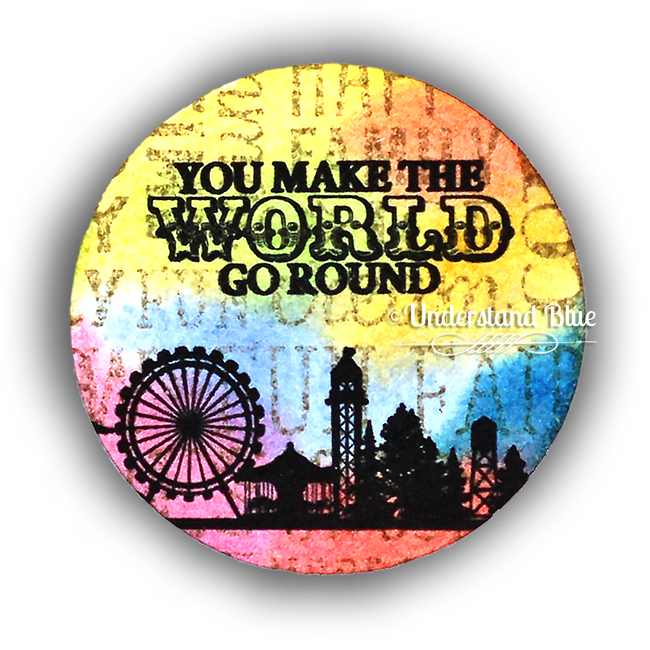 Then I stamped it with the add-on County Fair Bold Print stamp in Wet Cement Ink before stamping the sentiment and image from the kit in black. I glued the paper onto two more circles I cut from this lightweight matboard before mailing it. I love making these trading coins, and I have more coming up for our larger swap in our group, so stay tuned for those soon! ATCoins are 2.5 inches, and that just happens to be one of the die sizes in the Circle Infinity dies, which made me squee a LOT when we set up this swap, and I became obsessed with making these. Now - on to the add-ons! 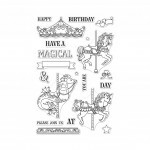 First up - a stunning carousel set with matching dies where you can switch out the carousel images and use the top and the bottom on each image. I decided on a warm, vintage pink, so I mixed Quinacridone Gold and Quinacridone Rose watercolor, and then added some shimmer on top with Pearlescent Shimmer. You can barely see the sparkle here, but it's really shimmery and fun in person. The sequins are the Like Magic ones, and the card base - if you look closely - is my dark brown wood grain cardstock, which just felt right with this image. Next, I did some combo projects, where die cutting gave me the pieces I needed for a second project - I love project that naturally double themselves. First, I stamped three card fronts with background stamps. 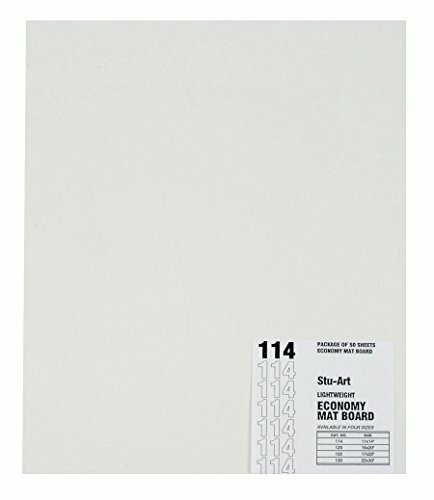 I'll list the supplies for all three cards under this first one, because the supplies are so similar. All three feature the County Fair pig images, which are adorable, and the matching dies, and I cut all three card fronts with the circle infinity dies to make an opening for my piggies, which are all colored with Copics. 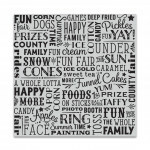 This first background is the Brushstroke Bold Print, stamped in Intense Black. Next, I used the Scribble Bold Print the same way to send hogs & kisses. 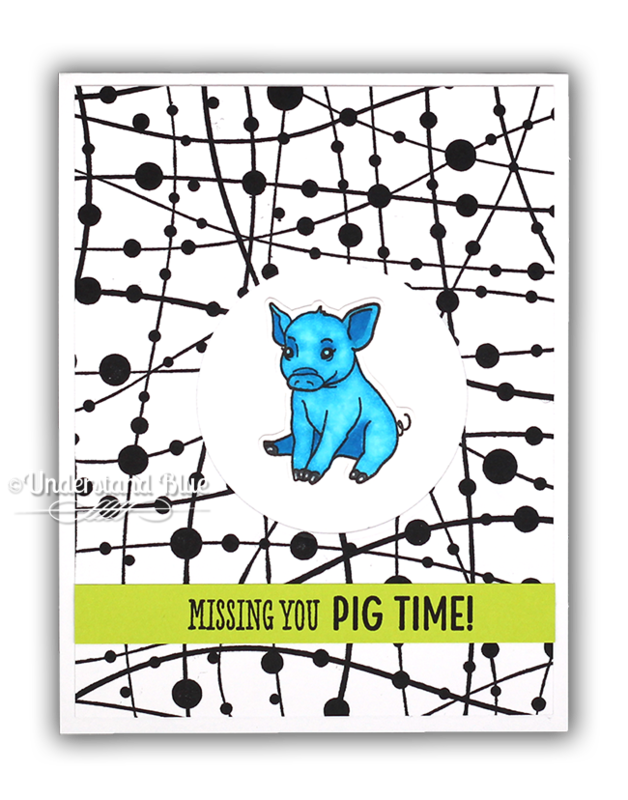 Finally - I had to make a little piggy who is blue because he is missing you pig time! :) He's framed by the Festive Bauble Bold Print stamped in Intense Black. 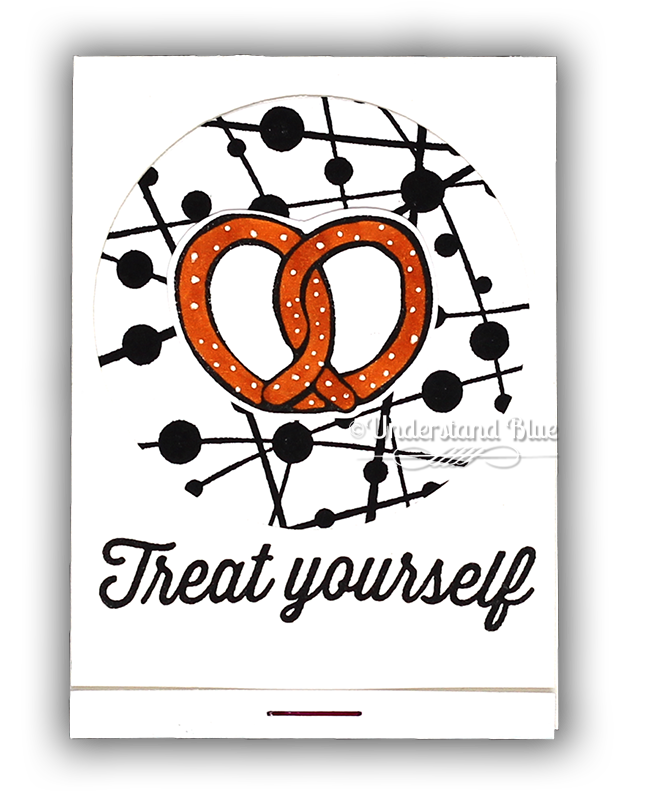 Now that I had those circles cut out, along with one stamped with the Filigree Pattern Bold Prints background that I didn't make into a card, I had the perfect backdrops for three gift card holders. Half of a 4 bar card size is the perfect size for a gift card holder, so I cut those up and scored them so that I could do a matchbook style gift card holder with a pretty colored staple. 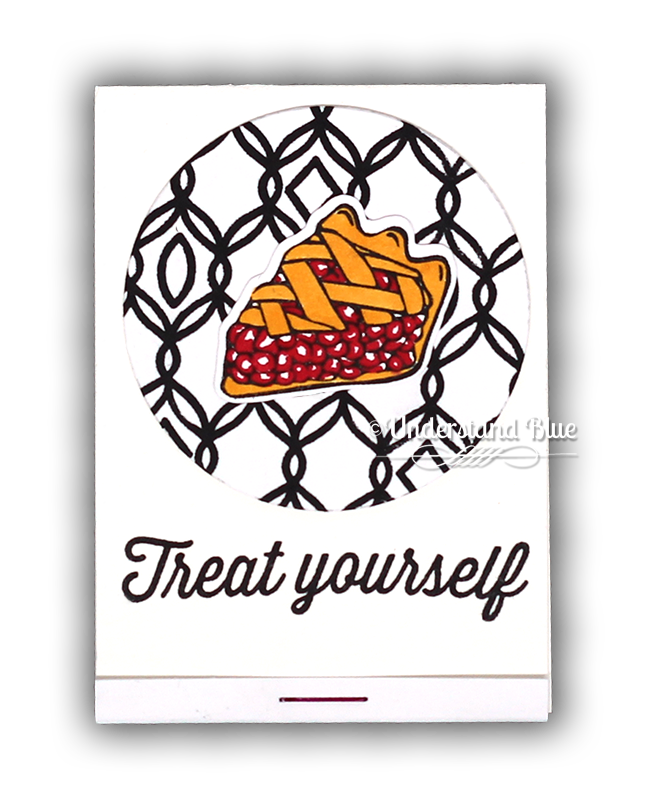 The images for all three are from the You're Sweet as Pie add-on set - the images are awesome and the perfect size for coloring, so I die cut all three with the matching dies and placed them on the leftover patterned circles on each gift holder and stamped the sentiment from the set. Love that cherry pie. Then I had to try a rainbow bright snow cone! Then for the last one, I did that adorable pretzel from the set, and accented it with a white gel pen. 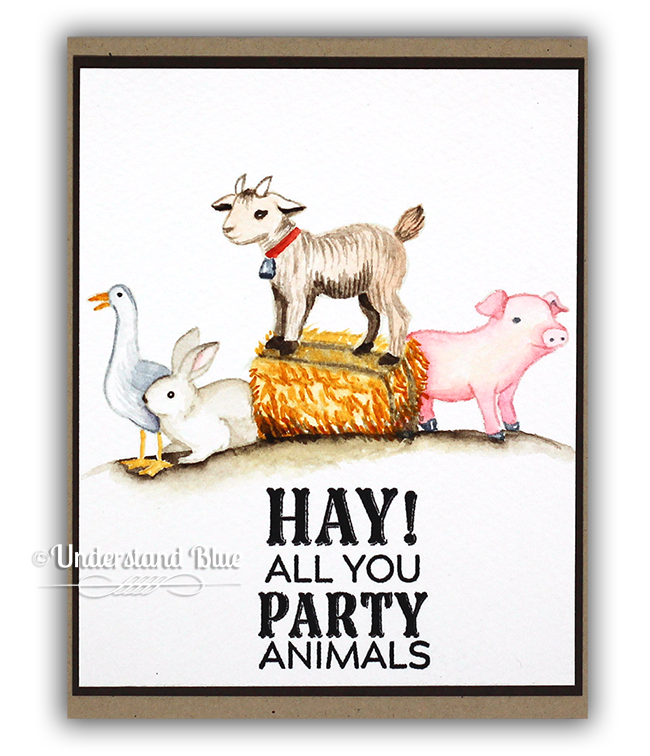 Those were so fun and easy to make, so I thought I'd give myself a challenge and so some masked no-line watercolor with the supremely cute Hay Party Animals add-on set. This set does come with matching dies. During this watercolor and video (below) there was a series of unfortunate events, which I discuss in the video. BUT - they prove that a) you can fix watercolor mistakes and b) you can fix masking mistakes. So don't give up on your cards when you realize you've done something really bone-headed. The paper is Fabriano, and the watercolor is Daniel Smith. So do you want to watch the video and see my hilarious mistakes? Enjoy below or click here to watch on YouTube in HD. They are offering all the add-ons at a discount this month, as usual, so you can grab those when you order the kit. 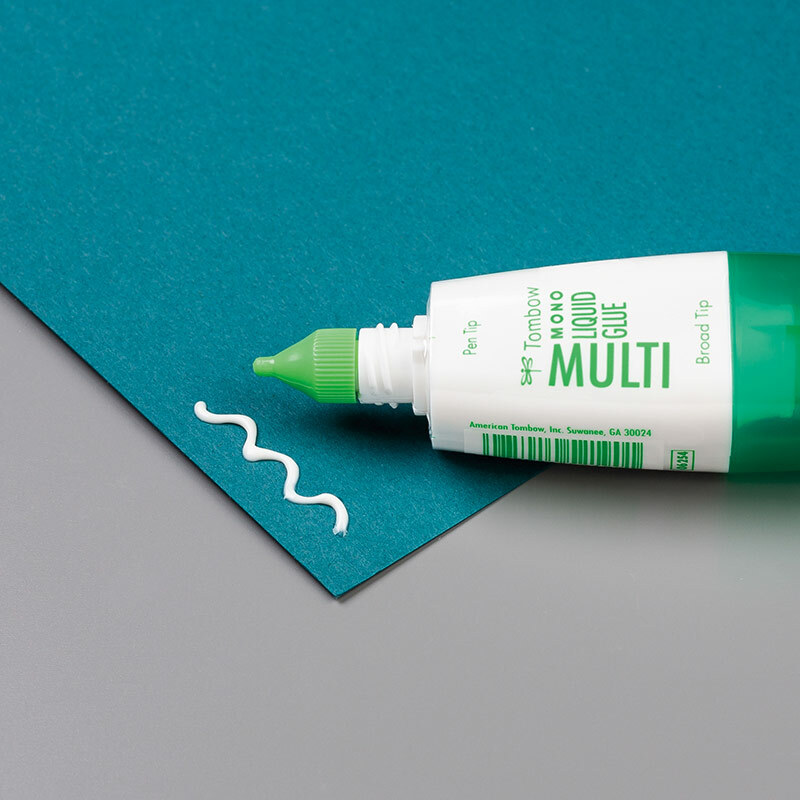 I'm pretty excited that they released a new liquid watercolor with the add-ons, so I'll have to order that, especially now that I got my new shelves for all my coloring mediums. Here's what is included in the discounted bundle, and you can also get them individually. As usual, Hero is giving away one kit this month, and if you win and you're already a subscriber, they will give you a refund. You just need to comment on the blogs in our hop today, and your next stop is my sweet friend May. So now that I've given myself and probably you the hangries for a corn dog and a snow cone, it's time to go find a snack! Superb, what a website it is! This web site gives helpful information to us, keep it up. 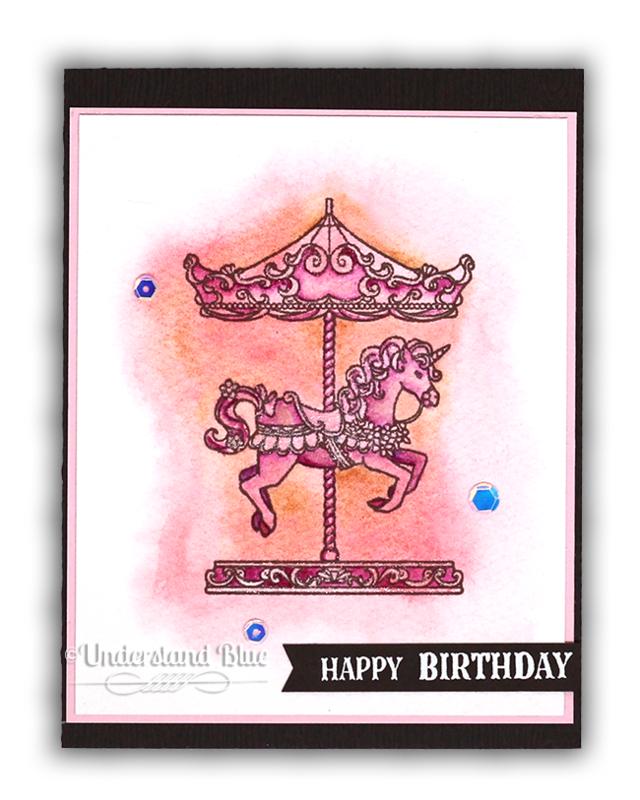 Love your carousel card! Such pretty colors and fun cards! 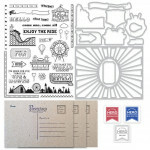 Wow - so many cute cards and wonderful stamps in this kit and add ons! 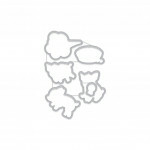 I think that your samples are my favorites!!!!!!!!!!!!!!!!! Your watercoloring is just beautiful. 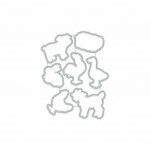 Those little animals are so cute. Thank you for inspiring me to watercolor more. AWESOME cards, fabulous colors and backgrounds. Thanks for sharing your creativity and ideas. I love all your cards! You really stepped outside the box to show off this kit! Love them all! Wow, this is quite a variety of cards! Great inspiration, especially the way you used different backgrounds to highlight the focal points. I'm enamored with every single card you made! Without a doubt, my fav stop in the blog hop(ssshhh... don't tell!! Lol) My favorite of favorites is the Party Animals!❤ You are wonderful at watercoloring & that card deserves to be framed. Great cards! Your ATC is just fab! And, I love those bold graphic backgrounds - I've never seen that brushstrokes bold print before - it's fantastic! Your no line water coloring is amazing! Your description of corn dogs and fairs made me smile and I swear I could smell those corn dogs. Every fair I’ve ever been to, regardless of what part of the country I was in, (Illinois and California State Fairs) smelled of corn dogs, LOL. Fabulous, fun cards. But my heart is drawn to your first silhouette card. I love it. I agree that any food on a stick is awesome. Love your cards, especially the piggy cards! So cute!! Awesome array of cards! Love those fun piggies. 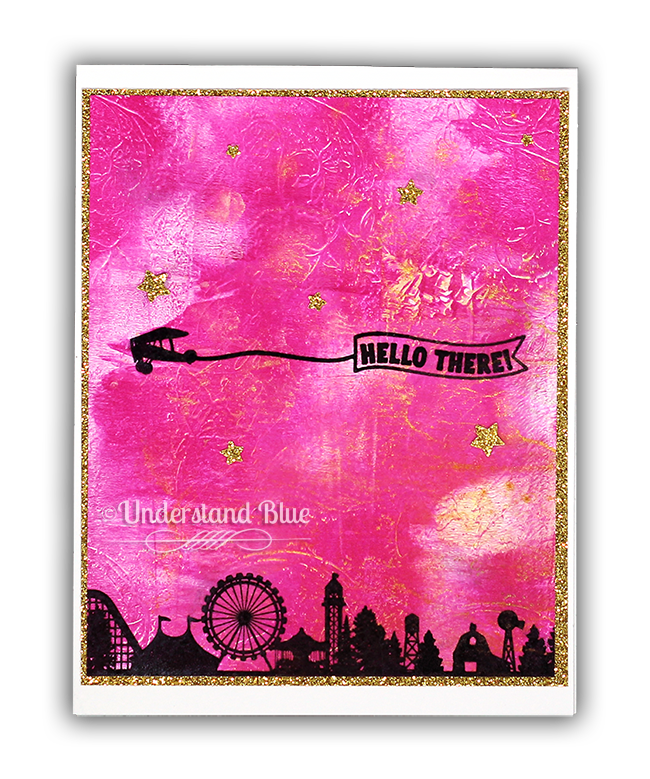 Such fun backgrounds including the gell print, love your cards. This whole release is so cute! 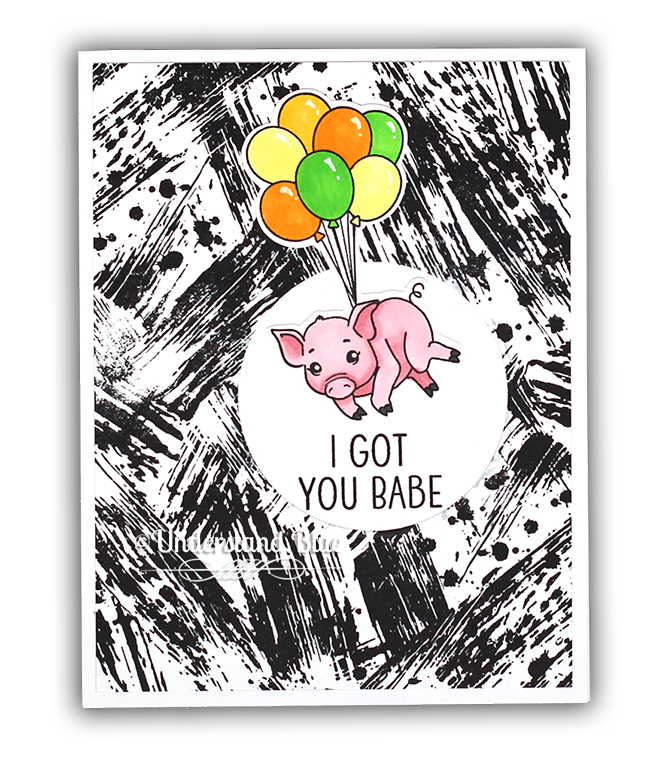 And I love your watercolored farm animal card, floating pig and all! WOW FANTASTIC CARDS! You were really busy! So many fun styles! And the coloring is AWESOME on each of them!!!!! WOW.. these are all so amazing.. all that creativity in one spot.. let me send you some corn dogs so you'll stay there, nice and content! Oh gosh, I can't even decide which of your cards is my favorite! I just love them all! My favorite image is the silhouette as well - followed closely by that carousel pony! Thank you so much for the terrific ideas! You were right.. this kit is awesome! And after seeing everything you created. I think I need it ALL! Thank you for inspiring me and for also making me hungry! Love your cards Lydia! My favorite is the snow cone one. Probably because I'm into rainbows with a lot of black/white to contrast lately. I wonder what you all are doing with these artist trading coins. I hope you will do a blog post on it. If you haven't already. I'll admit I am a bit behind on your blog! I will catch up, I promise! I do love reading your blog. Great cards and coin! And the new kit looks like another winner from Hero Arts! So not only do I want every single item in this release after seeing your cards, I am also craving a corn dog. What could be better than eating a corn dog while making cards? Thanks for sharing your creations with us! Such a great variety of cards that you made and it looks like you mad great use of the kit add ons. I like your color combinations! It's a cute kit and your cards are so fun! Lubbock Texas! Just wanted to tell you keep up the fantastic work! All these cards are great. I especially like the pigs. They are so cute. Lovely cards !! A beautiful way to use the new kit! Ok, seriously craving a corn dog now! Amazing collection of cards. All so fun and wonderfully summery. Love your cards. My favorite hands down is "hey you all" it is too cute! 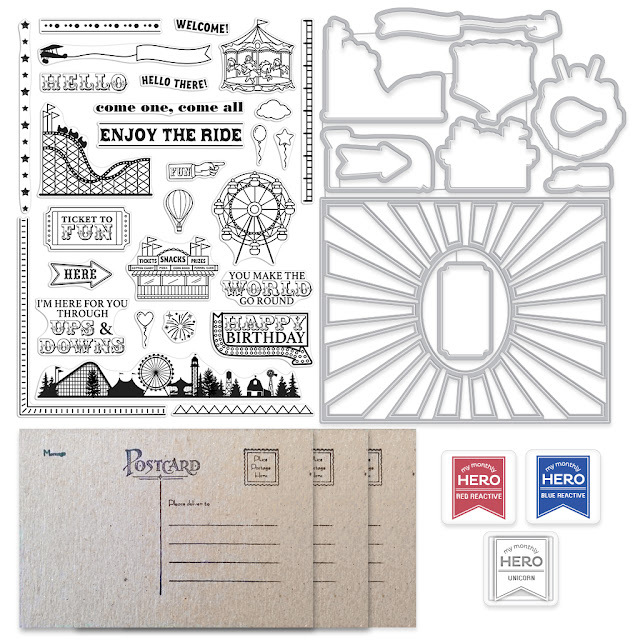 Great variety of color combinations and selection of stamped items. Keep up the good work. Hugs! Love all your cards!! The pig is so stinking cute!!! Texas state fair has the best food!! I look forward to it every year!!! What a fun new release. I can see the plane flying over the beach (last month's kit). 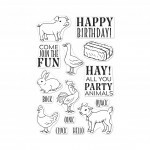 I enjoyed all of your cards, but especially the Hay There card with all the farm animals. You really went all out with these items! I love you water coloring. It has a old world feel to it. You are quite versatile, thank you for sharing. Wow wow wow! This post is an absolute feast for the eyes.....like walking down the Midway...so many wonderful things to see! I love our county Fair at the end of the summer....and I love this new release! This kit is amazing and so are all of your creations! They are all so much fun and would brighten anyone's day! Like the colored backgrounds. Especially like the airplane with banner. Been there...long time ago..to the Texas State fair. Grew up in Ft.Worth. There is nothing cuter than a baby pig and these add ons are almost cuter than the kit although the kit is a keeper. Lydia, these are ALL so much fun and all so gorgeous! I especially like your ATCoin! The colors and designs are so cheerful and fun and capture everything I love about summer! Thanks for some fun inspiration today! It's always hot when the fair rolls into town! Love your cards and ATCoin. WOWZA. Love all your gorgeous and inspiring projects...that snow cone ROCKS. The background on your first card is gorgeous. I do love this kit and your creations show the versatility of this release. All are wonderful. Oh I just adore your work....all of it. Love the backgrounds and layout. What talent!!!! Great cards, Lydia. County Fair is a great theme for summer cards. Our fair starts next week. Love the coin!! 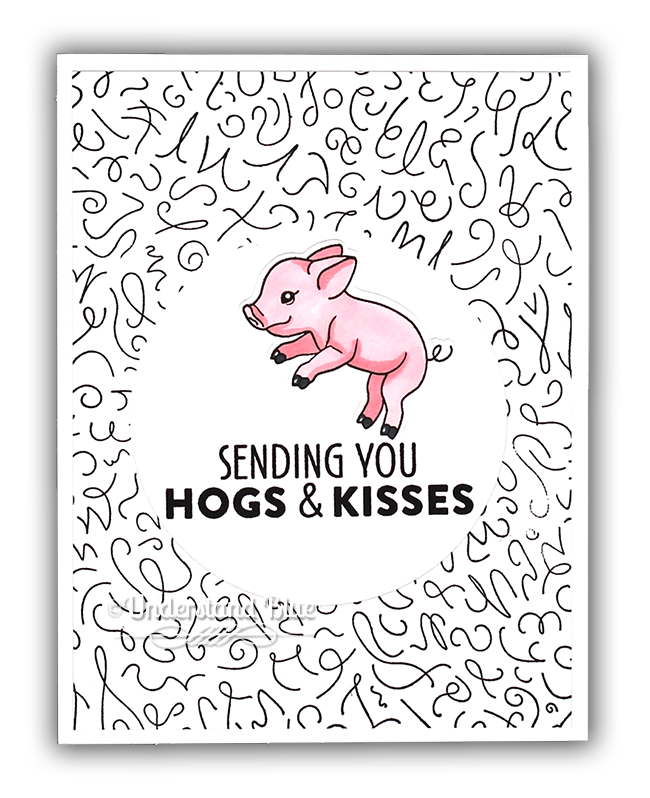 And the Hogd and Kisses card is adorable! These cards are all so fun! Love your ATC (which I had never heard of before joining your group). I was so excited to see your name on this blog hope!! YEAH!!! 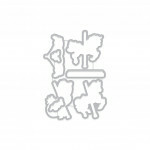 Your work is inspiring. I love the “Missing you pig time”. Thank you!!!!! Your cards are beautiful, as usual ! I specially love the first and the last one, they are very different and I find both of them very inspiring. Fabulous cards! 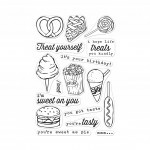 I love all the various backgrounds you used! Love, love, love your cards! The background gel print on the first one is stunning! Thanks for all the great inspiration! What a variety of cards --- you are so ambitious! My favorite is the carnival with the beautiful background of colors! Eeek! Those piggies are adorable and I love the county fair theme! Love you cards Lydia! They're so fun. Deep fried butter? I think I'll pass! But your cards are definitely making me drool. 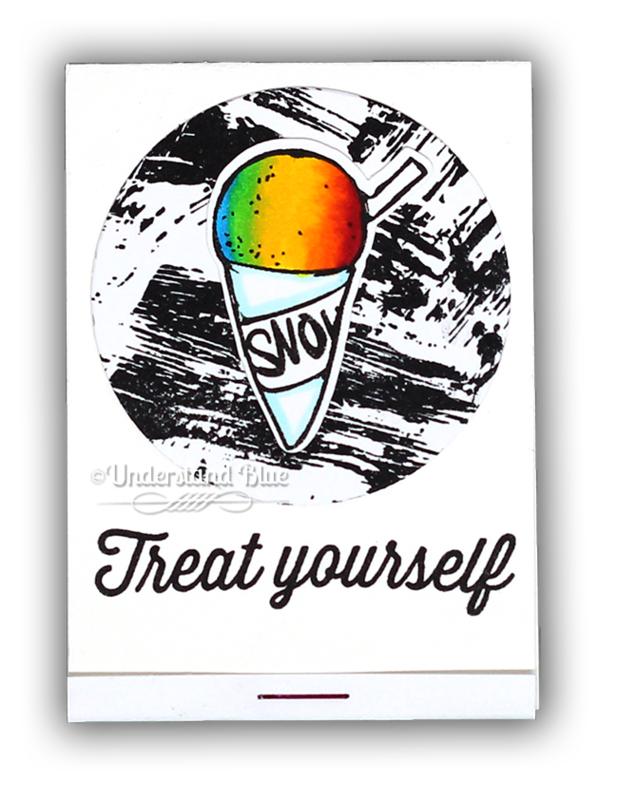 I think the snow-cone card is my favorite. Live the colors! Thanks for these great inspirational cards. Loved the video and how you rescued it.. I can't wait to get my kit, but I might have a wait as I live in the UK. such great backgrounds! This kit and add on's is so good! These cards are AMAZING!! I love all of them! Especially your coin card! you create amazing and stunning backgrounds ! your cards are so beautiful! Wow--all of these are great. Great backgrounds and cute critters. I never heard of Artist Trading Coins before. Wow! Fabulous use of this beautiful kit!!! Love all your gorgeous cards!!! Your backgrounds are just amazing! Thanks for the inspiration. 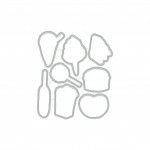 Lydia-Love your cards and the use of all these mediums! Looking forward to meeting you and taking your class at Junkiefest! Such gorgeous work! You have so many great ideas. Thank you for sharing! You are the over achiever!! Every card is great in its own right! But from the first to the last, all unique endeavors! Gorgeous and so creative!! Thank you for such fabulous inspiration with the newest release! 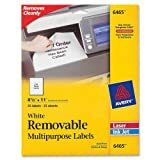 yours is the 2nd card maker that I have seen that had used gel press paper. love seeing the black and white background then used colored images. 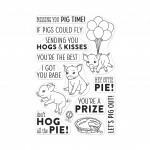 I especially love the pig cards with backgrounds! 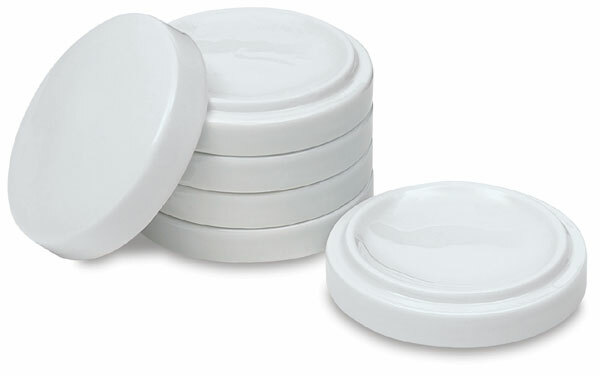 Looking forward to many ideas with this set. Silly physics! Love hearing you laugh! So cute! That pig has to be one if my favorites! Great cards and very creative backgrounds. That silhouette image is a must have! You showcased it beautifully!!! Nice! I totally went to the Texas State Fair - might have been 1992. Did I see you there? Let me just say, AMAZING! Okay, now I really DO want a corn dog! And this kit! Lots of fun cards! Love the carousel and party animals. 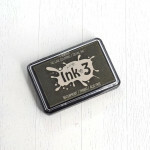 Masked Ink Blending Two Ways + A Discount!